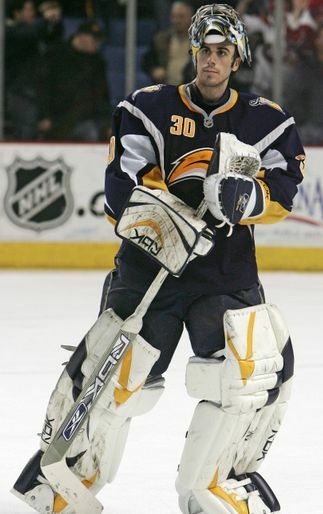 In recent years, Buffalo Sabres' goaltender, Ryan Miller, has inserted himself into a group that boasts names like Roberto Luongo, Tim Thomas, and Ilya Bryzgalov, that group being the NHL's elite goaltenders. This superior play has been the factor that has held the Sabres together in many occasions over the past few seasons. However, last season, Miller's Vezina worthy numbers from two seasons ago, dropped substantially. After finishing off the season with a 2.59 goals against average, and a save percentage of .916, Miller looked human. A factor that played a major role in the drop in Miller's performance may have been his supporting cast. The Sabres' allowed an average of 31 shots per game, ranked 16th in blocked shots, and 19th in take-a-ways. Resulting in Miller often being relied upon on to back stop and save the Sabres'. That should all change come time for puck drop in early October. Due to the Sabres' big spending during this year's free agency, they locked up defensive players that should provide a jump start to the Sabres' defense. One of the biggest defensive players added to the Sabres' line-up was Christian Ehrhoff, who signed a nine year contract, making an average of $4 million over the duration of his contract. Ehrhoff may not be the most defensive defense-man in the world but his ability to move the puck should allow the Sabres' to create some quick rushes out of their zone. Ehrhoff's ability to make that first break out pass should reduce the Sabres' time spent in the defensive zone substantially. Along with the addition of Ehrhoff, the Sabres locked up Robyn Regehr, who is quite the opposite of Ehrhoff. Regehr, also signed early in the free agent frenzy, and is more of a defensive minded defense-man who will compliment the offensive mentality of offensive d-men like Ehrhoff and developing star Tyler Myers. Regehr,31, should have a few years left in him before he heads towards retirement and will be a great fit in Buffalo. Continuing with Myers, each year is another year of experience and development for the young two-way defense-man. Myers won the Calder Trophy, as the league's top rookie, two seasons ago. However he fell into the sophomore slump in the beginning of last season but found his stride in the second half, finishing the season off with 10 goals and 37 points. The 6'8" defense-man is on his way to being one of the NHL's elite defense-man. Veterans Jordan Leopold and Shaone Morrison provide the veteran feel in a locker room where half of the defensive players are 25 or younger. Young players like Marc-Andre Gragnani, Adrej Sekera, and Mike Weber, who are the future faces of the franchise, can gain some valuable knowledge while those seasoned players are in Buffalo. All together, Miller should not have to produce outstanding play, although that would probably be ideal for all those supporting the Sabres, in order to get the win. Miller will no longer have to win games, rather he will have to not lose them. A defensive cast that received a much needed face lift should provide Miller with the support he has needed in recent years, making the Sabres a definite contender for a division title and possibly the Cup.